The skipper was heading from Exmouth into Torbay when after suffering engine failure he ran aground under sail on rocks off Meadfoot beach. 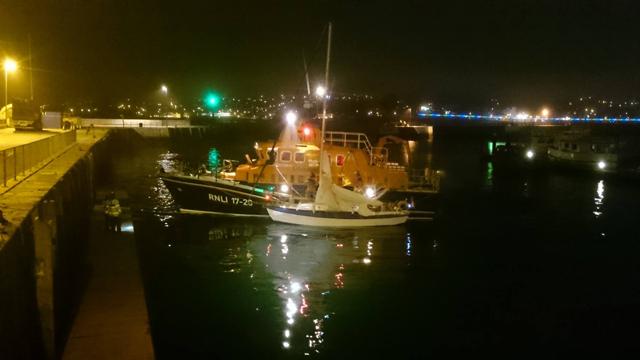 The volunteer lifeboat crew at Torbay RNLI launched the all-weather lifeboat at 8.45pm on Monday night and carried out the ‘challenging rescue’ while the Torbay Coastguard lit the scene with floodlights. 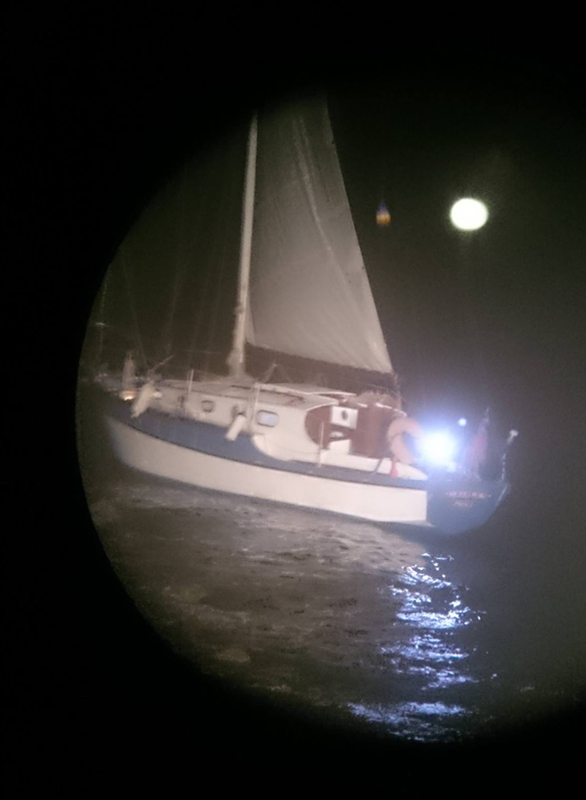 Roger Good, Torbay RNLI’s Deputy Second Coxswain said: ‘It was a challenging rescue, simply due to the thick fog which reduced visibility to almost nothing and meant we could make only very slow speed towards the location of the yacht. ‘It was only the lights from the Coastguard team which alerted us to the exact position. ‘Due to the depth and visibility, I couldn’t take the lifeboat in very close, so the smaller inflatable Y boat was launched from the all-weather lifeboat with two crew members on board. 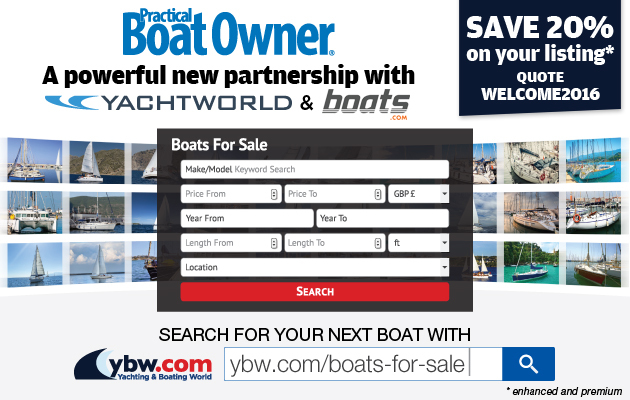 ‘They went in closer to assess the situation and found that the yachtsman was on the rocks, attempting to push his boat off. The volunteer crew took the yacht’s sails down which stopped the wind blowing her onto the shore, and attached a tow line to pull the yacht slowly off the rocks. They took this towline out to the all-weather lifeboat which continued the tow to deeper water before attaching a more secure tow. The lifeboat then took the yacht into Torbay Harbour where a plan was made to put it on the slipway and pull it up as the tide came in. A Torbay Coastguard spokesman said: ‘We were called to reports of a boat with engine failure, taking on water, on the rocks at Meadfoot Beach. 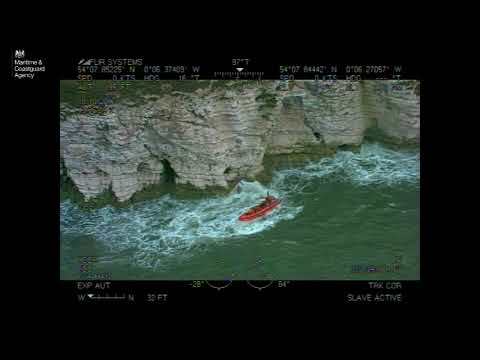 ‘Once we located the vessel we provided lighting whilst Torbay Lifeboat launched their Y boat to recover the casualty off the vessel, and then began to pull the vessel off the rocks.